Egg and lettuce soup. A traditional Romanian spring soup. There’s no way around it. In Ardeal (the central region of Transylvania) this is one of the most loved spring-summer-autumn soups. You eat it with a spoon, so it’s a soup, but it’s a main meal. Vegetables, although not many, meat and eggs in the same bowl. Other cultures do the same thing, think about the Japanese and the Koreans and the Chinese with their noodle bowls that have everything in them. 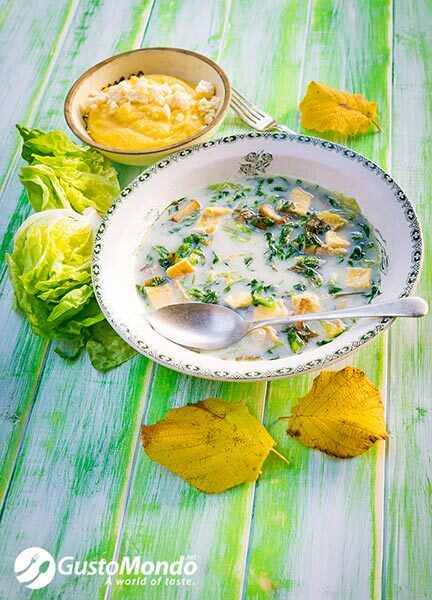 As with all Romanian dishes there are a lot of variations to this egg and lettuce soup. But this is my way, the way my granny and my aunties and my father made it, and that’s the way I love it most. Beat all the eggs with a pinch of salt. Heat some oil in a frying pan and cook the eggs until you get an omelette. Leave it to catch on some color, nice and golden. Leave to cool and dice the omelette into 2x2cm squares. Keep aside. Chop the onion and the bacon into small cubes. Lardo (a type of pork back fat, salted and cured) can also be used instead of bacon. Fry in the pan until the onions are soft. Cover with water and leave to boil on a low heat for around 10 minutes to get the flavor out of the bacon and soften it. Add the shredded lettuce to the pan, and the eggs. Make sure there’s enough water, add more if needed. Bring to boil again, season with salt and pepper to taste. Season (bit by bit, not too sour) with vinegar. Boil for another 10 minutes. Turn the gas of and crush the garlic cloves into the egg and lettuce soup. Leave to stand for 20 minutes. After 20 minutes, temper the sour cream (or creme fraiche) with the hot soup. In a bowl add the sour cream, and slowly, ladle by ladle add some of the soup mixing continuously. When the liquid in the bowl has the same temperature as the remaining soup in the pan it can be mixed back into the pan. That way you don’t run the risk of splitting the sour cream into the very hot soup. « Cabbage and mince meat “pie” layered with tomato sauce. Traditional “Varza a la Cluj”.